A taxi driver I once hailed in Dadar not too long ago made a strange comment when our conversation turned to the recent directive the Maharashtra Government had issued to banish taxis older than 25 years from Mumbai roads. 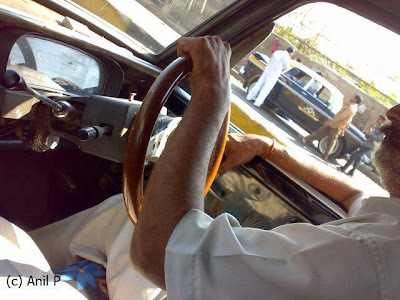 He was behind the wheel of his Premier Padmini, the car of choice for Bombay taxi drivers. “Actually the ban has helped,” he said as he kept his eyes on the road ahead. I had expected him to criticize the decision like many of his brethren had. It was a contrarian view in the best tradition. I kept silent and waited while he threw his weight behind the wheel to swerve past a Municipal Corporation truck that had suddenly backed up to the middle of the road while maneuvering to a garbage dump on the side of the road. “Helped? How?” I responded, surprised. I remember Taxi Unions berating the Government while mobilizing support for its appeals process challenging the directive in the Courts. Several taxi drivers I spoke with subsequently bemoaned having to take loans for the newer but costlier alternatives to the Premier Padmini. In a city like Bombay a status quo often means a lifeline to survival. But the Government was determined to change it. The appeal was thrown out. I was interested in his perspective given that he did not have much time left either with his own taxi. While steep import duties on imported parts had ensured that the Indian Auto Industry survived the 1950s, and through the 1980s, the Premier Padmini had other things going for it as well. It was robust, cheap, no frills, and easily serviceable. 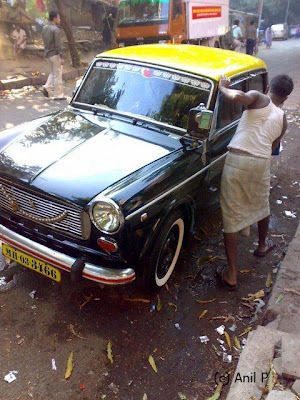 Bombay taxi drivers took to the Premier Padmini in a big way until the last of the Premier Padmini rolled out of PAL’s Kurla plant in 1997. Earlier, the production of the Premier Padmini, a variant of the Fiat 1100 that originally entered the Indian market in 1954, ensured a steady supply of spare parts that owners of earlier Fiat models in the 1100 series could use, prolonging their road worthiness. And there were several Fiat models to the Fiat 1100 series – the Fiat 1100/103, the Fiat Millecento, the Fiat Super Select, the Fiat 1100-Delight, also known as Fiat 1100D, the Premier President and finally the Premier Padmini, a close relation of Fiat 1100D. The Premier Padmini was available in a Deluxe-BE version as well. However, not all modifications resulting in a newer version of the Fiat were substantive, some were minor. Fiat models other than the as yet ubiquitous black and yellow Premier Padmini taxi cabs are a rare sight on Bombay roads, so when a brilliant red model pulled alongside at a traffic signal I could not resist leaning out the rickshaw I was traveling in to capture the moment. There’s little to do when negotiating Mumbai traffic. Occasionally I let my eyes roam the dashboard, seeking distinctive features that might differentiate the interior from that of another Premier Padmini taxi. Usually there’s none excepting of course the deities that ride on the dashboard. Occasionally, an innovative use of dashboard space will see an incense stick holder attached below the deities, surely a better choice than using a bar of soap to stick the incense sticks in. And if the taxi happened to use spare parts cannibalised and modified from another car model there is no way I would know of it unless it was visible upfront, like the steering wheels that come to steer the Premier Padmini though I need to make an allowance that some of them might be an original fit, some that is, not all. So when I slide into the seat and stop short on spotting a fancy steering wheel it turns into a premier morning moment of the day. 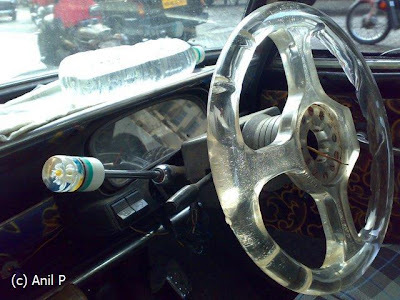 Of the steering wheels, and there are not many that deviate from the standard issue common to most Premier Padmini taxis, the transparent one I saw upon hailing a cab last August must rank among the more memorable ones I’ve seen over the years. It stood out up front, its translucence contorting the life outside, tiny figures moving along the circumference as the taxi pulled ahead. The gear shift was fashioned likewise. 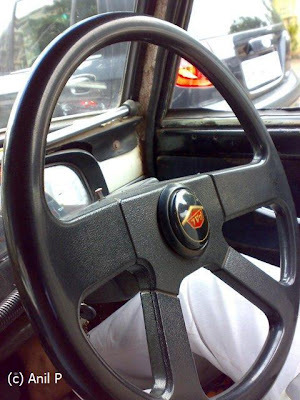 The wood-textured steering wheel ran the transparent, fibre-glass version close. It had the smallest diameter of the rest. When I asked the cabbie on a warm February morning last year if the smaller diameter presented difficulties in steering the taxi, he smiled and philosophized thus. “Like in life, one gets used to everything,” before emphasizing, “eventually that is.” I did not open my mouth any further. His hand comfortably spanned the wheel and he used it to good effect to rest his hands at traffic signals or when caught in a jam. “This car belonged to a Doctor before I purchased it from him,” the cabbie I hailed one sultry Bombay evening announced with some pride as he reached down to the floor to throw the gear forward while steering the taxi with the other hand. The steering wheel had a bulbous character to it, and might’ve been in good company with rich upholstery, and that might’ve well been the case. It was September of the year before, and the rains were showing no signs of relenting. 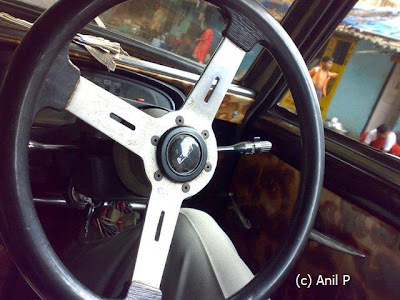 Unlike most steering units in black and yellow taxi cabs on Bombay roads, the gears in this taxi were mounted on the floor, a feature the taxi driver favoured over those mounted in the steering unit. I could not help reflect on what the philosopher cabbie had opined earlier about everything making sense, in time. “A doctor used it earlier,” he repeated, expecting me to acknowledge his good fortune. A good fortune it is for, a doctor’s car is valued in India and probably commands a better resale value from the rest. It is generally believed, and not without reason, that doctors are careful creatures, preferring discretion over bravado, and can be relied upon to avoid clambering over road dividers in drunken stupor from late night partying. Still better if they’re running a clinic of their own for, it’ll leave them with little time to canter over long distances, ensuring fewer kilometers on the odometer. Why, there’s just a chance the tyre is original and possibly the threads are intact as well. Likewise, doctor brides are equally valued, and so are doctor bridegrooms. The Premier Padmini is spare, austere even. There’s nothing inside that is not essential. So, even a hint of style occasioned by metal raises the mood within by a notch. 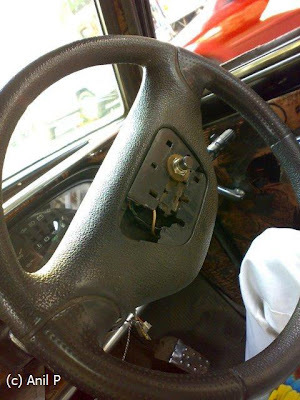 And it helps there’re not many instances of this version of the steering wheel about. The metal plates shone. I was tempted to ask him where he had sourced the steering wheel from or if the padding had been stripped off to expose the metal though it seemed unlikely to be the case. It might even be original to the model. Maybe he would not mind my asking him. Maybe he might welcome it even, pleased to learn of a stranger taking interest in the fittings, for there’re not many who take kindly to Premier Padmini testing the elasticity of their backsides on bumpy roads. For some reason I remained silent, letting the city outside drag my thoughts with it, into the crowds from which there was no returning. There’s much that is routine on an average day out in Bombay, common like the wheel above, yet helping steer life ahead, bumps notwithstanding! Note: If you’ve any pictures of a car you owned from the Fiat 1100 series and would like to share them along with your memories, I’ll be glad to run them in a post with due credit. Mail me at my contact listed in the side-bar. Thanks for another fascinating glimpse into life in India, the taxi culture. You are such a good storyteller, and photographer. I always enjoy your posts so much. what an excellent look at the taxis and the mind set behind a taxi driver. 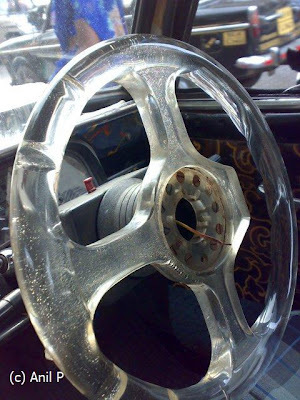 I loved the various steering wheel- the translucent one has to be my favorite one of all. Interesting about the new law. Thanks for the education. I love how most taxi drivers in Asia (and many in my former home of New York City for that matter) display deities on their dashboards. It's a reminder to me to take a minute or two or more during my day to remember God. Marja-leena: Thank you. 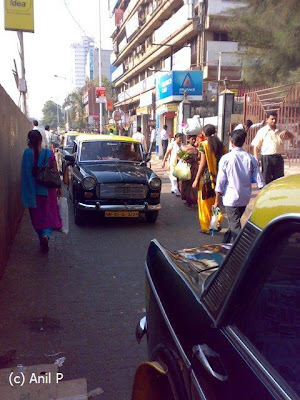 The taxis are integral to life in Bombay. And the Premier Padmini is now iconic simply for its association with growing up in India, close to 4-5 decades. Anjuli: Thank you. A few of the steering wheels in the pictures are clearly implanted from other vehicles. "Where are old Fiat Padmini Premier spare parts available?" is now the question folks owning them ask. Even then there are folks asking "Where can I buy old Fiat Premier Padmini?". So hopefully it will survive. Restoring Premier Padmini will be a task, with restoration costing steep. I'm not sure how many car restorers are around Mumbai though and what they charge for restoration. So hopefully the taxi culture as remembered from days of the Premier Padmini will continue. Shireena: Many taxi drivers were not happy with the law coming into force. They opined that it is the condition of the taxi that needs to determine whether it can be allowed to run on the road, and not mere age. 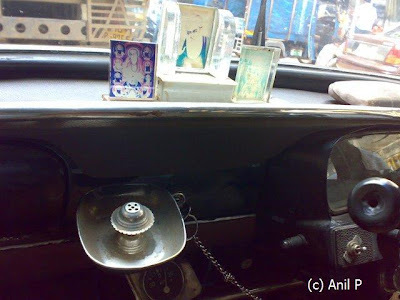 Many taxi drivers maintain their Premier Padmini car well. Maintenance of Premier Padmini does not cost as much as maintaining the alternatives would. The deities, yes. They pray to them early in the morning before starting on their day. Mumbai Paused: Great to know that. If you have pictures of your Premier Padmini and stories to share, mail me. I really enjoy the ingenuity of these drivers in keeping their cabs running with whatever is at hand. Literally at hand! You have rekindled fond memories of the Premier Padmini. Remembered the beautiful rides with all my cousins in the 70s in my aunt's Fiat. Another beautiful and enlightening post as usual. A wonderful attitude. Thank you for another informative post. I love how something we rarely look at closely, the steering wheel, is so revealing in its individuality and worth a second look. The transparent one was so unique! I can see why taxi drivers would be frustrated. If the vehicles are in good shape there shouldn't be any reason to retire them. Wow! U got so many pics to go with the write-up too :) Awesome! 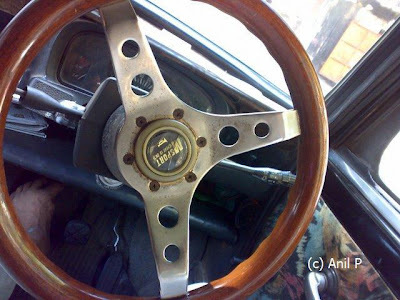 Anil, you can make even a steering wheel interesting to one who has never thought much about them before. Good post. Violet Sky: Yes. Now that the Premier Padmini production has ceased, has been so since the late 1990s, every original but used spare part is valuable. Soon, to get spare parts will be anissue for those owning the Fiat model. With the Government forcing Premier Padmini taxis older than 25 years off the roads, even those that are well maintained, the spare parts markets are benefitting from the taxis now heading for the Mumbai scrapyards. Private owners, fans, and collectors of the Premier Padmini are buzzing car forums with tips for fellow members on used but original spare parts to collect before they vanish from the market. It's better than to trudge through scrapyards for car parts. So, it's a case of 'buy used car spare parts while they are available'. Original Premier Padmini spare parts like the radiators, thermostats, and cosmetic parts like door handles, sun visors, cabin lights, tail lights, rubber beadings for doors, and other parts such as the unique front grille and wheel caps among other things will not be easily available once the lot heading for the scrapyards are stripped off and sold, especially if interested in retaining the original look. Shyamanga: Thank you. I'm sure they must have made for memorable memories. If you have pictures of rides in the Premier Padmini in the 1970s and stories to go with them, would love to hear of them. The quote: Yes, an attitude born from the need to survive the streets. Talon: That's been the grouse the taxi drivers have against the Government, the fact that it's been treated like the proverbial "throwing the baby out with the bathwater", banishing even the well maintained taxis. All these taxis run on CNG, having moved from Petrol of before. Mridula: Yes, some of them do not have horn caps on their steering wheels, but I suppose the wires sticking out are joined manually to honk, though I missed noticing if that indeed is the case. Radha: What model was the first Fiat your Dad owned? Premier Padmini (PP) is a sturdy car no doubt. Once, a taxi driver told me that his taxi, a PP, even after several years on the road barely tops 1000 rupees each month as maintenance cost. 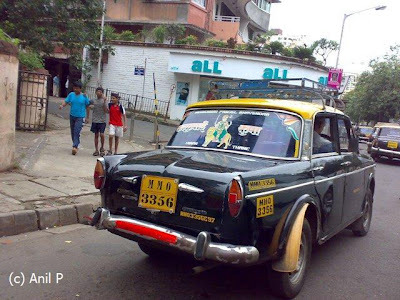 With Premier Padmini spare part availability set to become even more of an acute issue, the costs will rise, that is until his taxi ages to 25 years on the roads! Too bad there're no pictures to go with your time with the Premier Padmini. 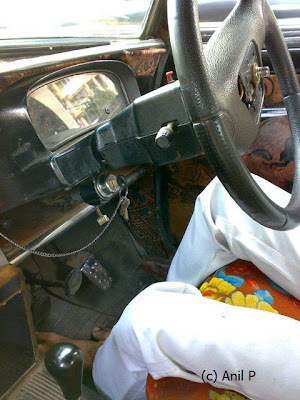 See how resourceful the taxi drivers are? TGF Cherry Blossom Street: They sure are resourceful. Like someone once said "Necessity is the Mother of all Inventions". Recycle helps to restore with good condition. Not bad at all. Good pics. Thanks for dropping into my blog. Nice blog, and great pics! I have traveled a lot, and love other cultures. I have been to countries where through poverty, or lack of supplies, the people do not waste anything! These people are the original recyclers! Priya: Recycling old car parts, yes. In Padmini Premier's case it is a compulsion. Lou: Yes, that is very true. The economics of the situation is often responsible for the recycling, and so also the cultural factor where children are brought up not to waste much. Good story. I dont know if you are in to fiction.If not, you must make an attempt.I see a great novelist in you. You have real style and substance. "Doctor used" appears to be a qualification for many things. Being a doctor,I dont think they care for anything in a better way.Their wives complain of being neglected,and their cars squeak as well. The effort you have put in shows in the pictures. Dr. Anthony: I'm not sure if I'll ever write a novel or that I'll be able to bring to bear upon the page the imagination that fiction needs. However, travelogues are a different matter. It's a pleasure to narrate them for the joy that remembering them brings. In narrating them the traveller relives the experience all over again, and in their recording one hopes to pass on the joys of travelling. In addition to the demand for "Doctor-used" cars in the used-car segment, the other plus that gets sold well is "It's a single-hand car", implicit is the belief that a car used by a single person is somehow less likely to have suffered abuse than if several people were using it. Moreover there's no way to check if that is indeed the case. Lovely post and great pics as usual! Suma: Thanks. The bonding will have been special for sure. Growing up memories around the Premier Padmini. I do remember my father's rickety old fiat, but I am really a Maruti 800 child and that's for another post all together. Fishbow: With Maruti Udyog Limited ceasing production of the Maruti 800 this year, yet another memory will gather dust. There must be many stories needing telling from your days growing up with your Dad's Fiat before the M800, pictures in black and white. 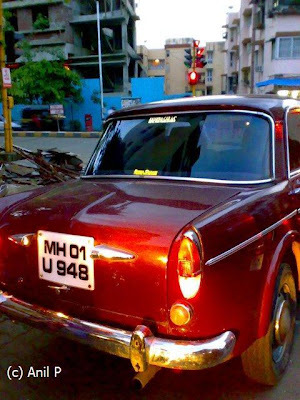 Limenlemons: Premier Padmini was indeed most folks' first car.